Kindle Unlimited is under attack from scammers – and this attack by Amazon KU scammers is hurting you and me as readers. Let me be clear, I’m not a fan of Kindle Unlimited. Amazon requires that a book in KU not be offered anywhere else. In the short-term, this exclusivity requirement blocks any reader who prefers a different retailer from getting that book. In the long-term, it is part of Amazon’s goal to drive rivals out of business or at least into nonentity status. That would be great for Amazon, horrible for readers and authors. Amazon would then dictate all terms of how you read and how I sell books. Absolute power. “Absolute power corrupts absolutely.” John Dalberg-Acton, 1st Baron Acton. I have no books in KU as an author. Nor do I belong to it as a reader. Yet I’ve spotted and reported gobs of these Amazon KU scammers over the past several months. I get thanked by Amazon … and nothing happens. This is the same experience of quite a few other authors trying to combat this KU cancer. Amazon could block these KU scammers. For whatever reason, it is not doing so. For a great look at Amazon’s non-action, read this piece by David Gaughran. There are many times when I think, what the heck, let KU drown in the scammer scum and good riddance. (I did say I was no fan of it. <wg>) So, why on earth am I spending all this time writing this? This is especially true of legit authors who have books in KU. I think they’re misguided to be in KU, but that doesn’t mean I won’t point out they’re being cheated by these Amazon KU scammers. When a KU member reads a KU book, Amazon tracks the number of pages read. (That’s the short version. The details boggle the mind. Scammers found a quick way to game that system, it hurt Amazon’s bottom line, so that, Amazon cracked down on.) KU authors are paid based on the number of pages read each month. The amount comes from a “pool” that Amazon allots each month. (The payment is a tiny fraction of a penny per page read and varies each month.) Each time Amazon KU scammers lure a reader to record “pages read” in one of their scam books, they cut down the amount in the pool left to be divided among the legit authors. –It ticks the heck out of me that these Amazon KU scammers demean creativity and the hard work of writing a true novel, novella, short story with this junk. –There are more good books to read than there is time and it ticks the heck out of me that they’re stealing reading time from all of us with this dreck. If you are a KU member, you can say that it doesn’t cost you to get one of these scam books, realize it, then junk it. But it does. It costs you time, it costs you lost opportunities to see legit books, it costs you lost opportunities to have a choice in the future as legit authors can’t support themselves, so won’t have time to write new stories for you. What do I mean by Amazon KU scammers and non-books? The most frequent variation is that they take a number of titles, say Titles A, B, C, D, E, F, G, H, in that order in the first “book,” which is called Title A. Then the second “Book” has a new title – Title B – with “bonus” stories B, C, D, E, F, G, H, A. The third “Book” has the title of C, then inside are “bonus” titles D, E, F, G, H, A, B. In other words, even if you wanted to read this stuff, you could get one book, read it, and be done. No reason to get any of the additional titles, because they were already “bonuses” in the first one. Be aware that this is not the only variation and that they will continue to change and evolve. Who are these Amazon KU scammers? Scum using clickfarms and other against-the-terms-of-service ploys to pull this stuff off. How they create the content is open to much speculation. A form of piracy is not out of the question. At least one author’s research led to Eastern Europe. But another Amazon KU scammers was in Vancouver, according to this article. Amazon’s algorithms could do this easily and efficiently. They do not. I’m left to the interpretation that Amazon is okay with its customers being subjected to this crud. I am not. So you’re going to have to be your own algorithm. No single one of these items indicates an Amazon KU scammer. Look for combinations. –A “book” that is listed as a thousand “pages” or more. –Beware of titles that never give you a sample of the writing in the “Look Inside” because they’ve filled up all the space with marketing/other stuff. –Few or no authors whose names you recognize included in the “book’s” Also Bought section. –Strangely worded bios. They frequently skip a, an, the, etc., in places where people familiar with English would use them. –TMI – naming their family members in their bio, including children. Many legit authors are careful about and protective of family members’ privacy, especially children. –Few to no reviews, especially on books that have been out for a while. The Amazon KU scammers will also hit many other red flags listed here. For example, one “author” ticked ~every~ other box on this list ~and~ released 14 books on the same day. None were listed as being part of a series. Another multi-warning sign “author” has released 154 titles in two years. That’s 1.5 books a week, every week for twenty-four months. –They have “books” listed as co-written, so there are two or more names listed as “author”, yet only one author’s name appears on the cover. –They have titles listed as co-written with other authors who also have simple/generic names, and all the bios have issues, as listed above. Especially if the bios repeat phrases from each other. –Some (but not all by any means) will use the same cover over and over, sometimes with variations of color wash. Though they seem to be getting smarter about this. — They will offer a “bonus” of a “bestseller” – In researching for this blog, I’ve just seen two that tout the bonus as a “#1 Amazon Seller,” yet neither of these bonus titles exists on Amazon. –The writing is … less than stellar. Okay, this is subjective. But, again, combine this with the other elements. Definitely look at the “Look Inside.” Beware of odd phrases … almost as if someone were translating, perhaps? — If there is a Facebook page, it is not very active. All posts are only about releases. No author photo. Only other pages liked are other questionable authors whose FB pages are also not very active and only have posts about releases, with no author photo. And, lo and behold, Author A’s FB page cover actually touts Author B’s book, while trying to get you to sign up for a “publisher” newsletter. –David Gaughran notes that Amazon KU scammers frequently hit over weekends because Amazon’s doing even less about this then (though how it can be doing less, I’m having trouble imagining.) I will note: The “author” with 14 titles released on one day, did that on July 4, a major U.S. holiday. Interesting. So add weekend and holiday releases as another potential warning sign. Is it right that you and I should have to do this much work to avoid being scammed on KU? No. You can let Amazon know you’re unsatisfied as a customer with this state of affairs – phone, call, email. Leaving KU would have the most impact. Because that might hurt Amazon’s bottom line. While Amazon shows no sign of dealing with this widespread, easily spottable issue of Amazon KU scammers, it has taken to sending legit authors odd, draconian, and unreasonable demands for immediate U.S. copyright registration … while the U.S. Copyright Office reports it’s taking 6-8 months to process online registration applications or 8-10 months for paper forms. Not to mention that copyright protection is not reliant on registration. None of that matters to Amazon. And, in the meantime, it says it won’t publish some books. One example: This week, the first week of July 2017, I received the copyright registration for Look Live, Caught Dead in Wyoming, Book 5, which was released Dec. 15, 2016. If Amazon had been applying this new standard when the book was released and chose to apply it (there’s no predicting when/why they apply it), readers buying from iBooks, Barnes & Noble, Kobo, GooglePlay, and a good number of non-US retailers would still have had the book, starting last December. Amazon readers would have had to wait until next week – or longer, depending on Amazon’s not-always-great turnaround time for such issues. If only it applied some of the energy going to this to removing the glaringly obvious Amazon KU scammers. Amazon is a race to the bottom. I think within 5 years all serious authors will leave it behind in favor of independent distributing. 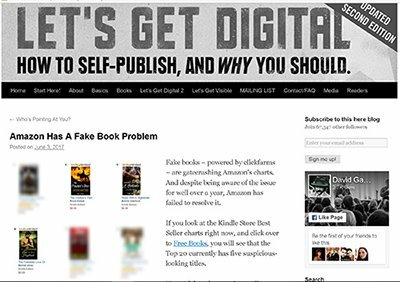 How about selling your books on your website, and place a link to it in your books on Amazon. When you have collected readers, then dump Amazon and sell your own. I USE THE BOOK DEPOSITORY it’s FREE SHIPPING. 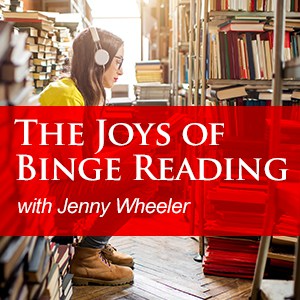 ALSO AS A FORMER VOICEOVER ARTIST IS IT SILLY OF ME TO SUGGEST AUDIO BOOKS FROM AUDIBLE A DIVISION OF AMAZON – ITS SO MUCH EASIER TO LISTEN TO AN AUDIOBOOK THAN READ.